With Independence Day just a little under a month away, it’s time to start thinking in red, white and blue! While I certainly don’t condone wearing the American Flag bikini (yuck), I do love to incorporate a little patriotic color into my wardrobe for the holiday weekend. This off-the-shoulder dress is on point – it would work as a coverup or a night out (perhaps with these earrings)! Another piece that would look great with just about any little white dress and make a fun statement is this Clare V. clutch. Not into wearing colorful clothes? How ’bout a red lip? Loving this shade. On another note, NET-A-PORTER just upgraded their sale! Now save up to 70% off all your designer favorites. Click here to shop the sale! PS – this morning I’m hopping on another plane to Los Angeles! I’ll be in California until Monday. Looking forward to soaking up the sun, sand and hopefully some shopping! Keep up with my travels by following me on Instagram and Snapchat (username: merrittbeck). Great edit! Love all the popping colors! Have a great time in CA! this has got me so excited for the holidays!!! I’m loving that topshop dress! Have fun in Cali! why would you put another killer lipstick on here?! I need another lipstick like a hole in my head!!! THat color is perfect! Such a fun roundup! And those fringe sandals are great! That dress and heels! You always find the cutest things! How is it almost Fourth of July already?? Great picks. This is one of my fav holidays! 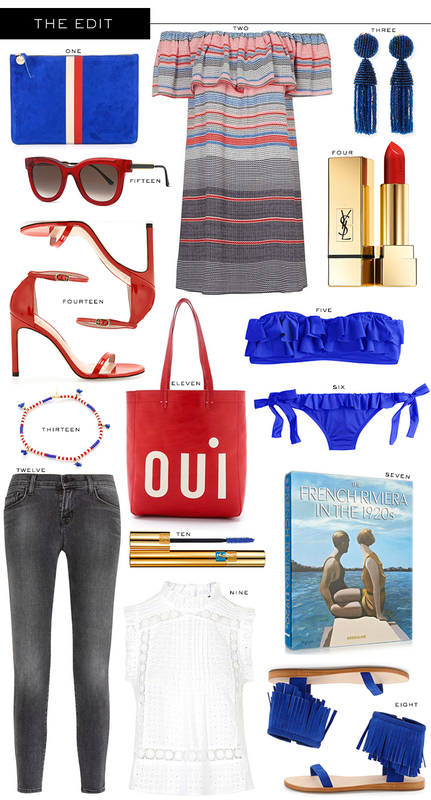 The dress bikini and clutch are my favorites in this post. Love the theme, and I agree about American flag bikinis!!! Some great finds. I may have to get that book! I have that Topshop dress on my “go to the store and check it out” list. I also like the blue sandals, which is a surprise to me and my fashion taste because I’m not a fan of blue clothes, well I like navy and that pretty much it. Anyway, good Edit. Love that blue bikini for 4th of July! Loving these shades of cobalt and that embroidered blouse is too perfect! Oh I love love love 9! !